Made from 100% NZ grown potatoes and are good honest natural chips. 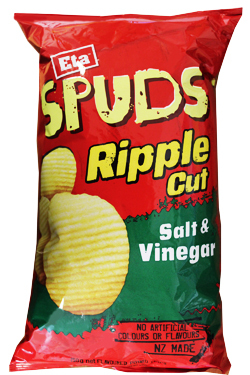 With amazing crunch and a full on salt and vinegar flavour, ETA ripple cut chips are a New Zealand favourite that are irresistible. Potatoes, Sunflower Oil, Antioxidant (E319), Flavour (Salt, Food Acids (E260, E627, E631), Milk Solids, Anticaking Agent (E504, E551), Sugar, Palm Fat).